When one thinks of an incremental number, a series of positive numbers comes to mind. Since IDENTITY columns are an auto-incrementing series of numbers, it is human to associate IDENTITY columns with positive numbers. However when we talk about numbers and the number line, we can go to infinity from both sides of 0 (-Infinity….-5, -4, -3, -2, -1, 0, +1, +2, +3, +4, +5,….+Infinity). As can be seen from the result of the script above, it is possible for the SEED, INCREMENT and the IDENTITY column value itself to be negative. Keeping in mind the rules of the number line (from elementary school), please note that as one moves away from 0 (in either direction), the number keeps increasing in value and is therefore incrementing. As shown by the quick experiment above, it is quite possible to have negative values for IDENTITY columns. As of writing this post, I do not have a practical implementation of this in mind. However, if you have ever encountered a situation where auto-incrementing negative values might be useful, do drop a line in the blog comments below. 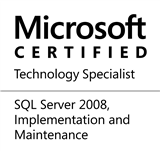 This entry was posted in #SQLServer, Blog, Imported from BeyondRelational and tagged #Identity, #SQLServer, #TSQL, DBA, Development, Myths, Series, Tips on June 10, 2013 by nakulvachhrajani.